It’s Friday, and you’re still a few painful hours away from escaping the doldrums of working life for the weekend. But here at Field of view, we give you an early escape; a secret passage to the latest happenings in the worlds of VR and AR. It’s exciting, right? Well, obviously, but let’s first round up what’s been going down this week before heading on this journey together. The big headline from this week was Microsoft’s confirmation that it has no plans to bring VR to the Xbox One – all while whispers continue to escalate around HoloLens 2. Elsewhere, we explored how VR and AR are being used to track food intakeand help treat eating disorders. But if you’re looking for that hit of news, as well as a couple of recommendations for when you’re under the lid, journey south and continue your voyage. This one’s been a bit of a saga, hasn’t it? After initially teasing the Knuckles controllers way back in 2016, Valve has been a bit stop-start on details regarding their functionality and release. Pretty much exactly a year ago, we received Knuckles details through a post from the company, hinting that they could be launched before the end of the year, but nothing ever arrived in the hands of HTC Vive users. But now, after another year of waiting, and the initial iteration going through testing with developers, we have another trove of information from the company, provided through a Steam blog post. 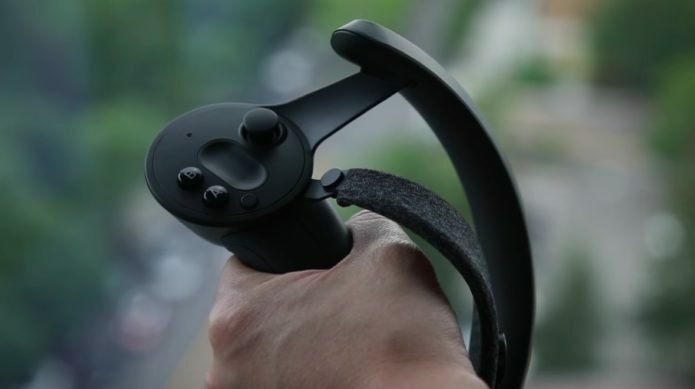 Valve has moved the Knuckles onto another dev edition, called the EV2, bringing a couple of pretty major changes to prior versions of the controller we’ve seen – detailed extensively in its post and in short videos like the one above. At least for now, the most apparent change over the earlier versions is the visible inputs, as opposed to the trackpad. The company also noted that the “hundreds of developers” will soon be getting their paws on the refined Knuckles and offering their thoughts. Will we see the final cut before the end of 2018? Will we ever see them at all? Well, CNETreports that shipping information will be announced soon, so stay tuned. Just in case you weren’t tired of playing the waiting game for Magic Leap One, an FCC filing has provided yet another tease for when the headset is set to land. We already know the company’s first set of goggles are set to drop before the end of the year, and the Control, er, controller is now going through the necessary testing ahead of launch. The filing doesn’t reveal too much more than what we’ve already seen of the device – it’ll feature a touchpad, a trigger, a single button and haptic feedback – but the fact Magic Leap has issued a Request for Confidentiality with the FCC does give us some clues about where it’s at in relation to release. As Road to VR points out, this confidentiality limits the FCC from publishing internal photos, test setup photos, and the user manual for 180 days from the date of the filing’s initial publish date. And although this is likely to be published if the Florida startup markets the device before the end of this period, 180 days puts the max release date at 18 December. Nothing is likely set in stone at this stage, but the fact that these steps are all being taken should mean things are pretty much on track. Stay tuned for details on pricing and a firm release date over the coming few months. From one Leap to another, this week saw Leap Motion introduce the first demo for the North Star prototype AR headset it revealed back in April. The company has no plans to manufacture the headset, though it is designed to replicate a high-end HMD for experimentation. And part of that experimentation, apparently, comes in the form of table tennis – as shown here. Through the North Star, which Leap Motion says brings “best-in-class field-of-view, refresh rate, and resolution,” the wearer is able to face off against an AI opponent, with the real-life table and paddle joined by a virtual ball and opponent. As we say, there’s no plans to bring this exact tech to market just yet, but it’s a fascinating look into the current capabilities of the medium. Let’s hope the folks at Leap Motion cook up something ready for consumers sooner rather than later. With the World Cup going on, it can be pretty easy to forget about other sports – not least motorsports, obviously – but let’s give you a couple of minutes of light relief by whizzing you around Montreal’s exquisite Circuit Gilles Villeneuve. Well, 1:10.764 of relief, to be precise. Here, we see Ferrari driver Sebastian Vettel fly around the track and set a new outright record, and you can view it all, albeit from a slightly odd angle, in 360 degrees. It’s a good job it doesn’t last too much longer, to be fair, as moving this fast through VR makes you feel like you’re about to take off into outer space. It’s that time of year again, where people from across the globe show off their creative projects at the Cannes Lions Festival. And, wouldn’t you know it, a VR project managed to come out as the winner in one of the top categories. Singaporean filmmaker David Liu and his team took home the Digital Craft Grand Prix award for a video made for the The Aeronaut, a track by the Smashing Pumpkins’ Billy Corgan. As shown above, the music video features a hologram performance by Corgan, who is surrounded by surreal virtual environments, with the footage captured on 106 cameras and presented in a 3D world.